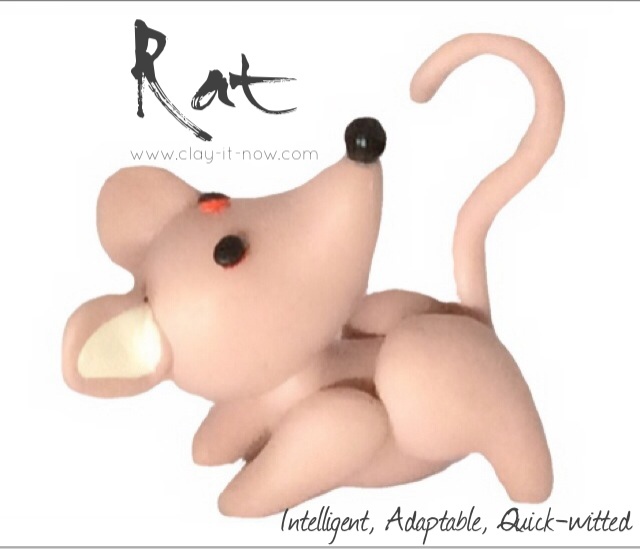 The rat salt dough was made based on my imagination and drawing following basic steps in my animal figurine page. 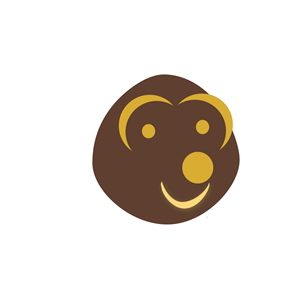 This is the first animal in my Chinese Zodiac series. Salt dough, fondant/ icing sugar for edible figurine or other type of air dry clay you have. Jewelry pin or a hook if you want to use it as pendant, key chain, home decoration, etc. when it is dry. First of all, plan on the color. Would you like to paint it after baking or before modeling the figurine? Most of my salt dough figurines were painted after the baking. 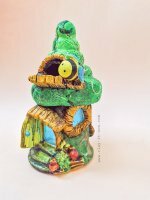 You might want to visit my clay coloring technique page for more info. Step 1: let's make the arm. Roll the dough to a sausage shape for about 5 centimeter length and then sharpen both end of the sausage. Bend it a little bit so it will sit nicely above the body later on. Step 2: Roll a ball shape dough with diameter about 1 - 2 centimeter. Roll another ball shape smaller than the first one (about 0.5 centimeter) and flatten it. Paste this on to the first ball shape. When it is dry, you can write a name or initial with black paint & brush/ marker. Step 3: Let's make the head now. 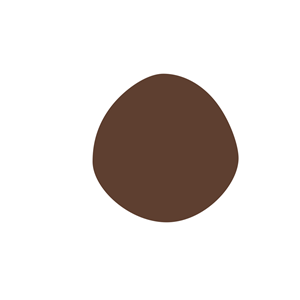 Roll a bigger ball shape and then slowly make an egg shape. 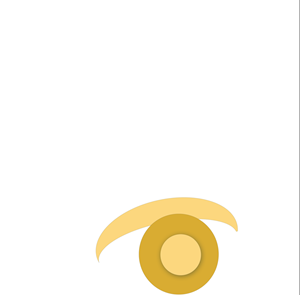 My drawing might not representing the actual shape but if you look at my figurine, the wider part of the egg is actually became top part of the figurine and the narrower part at the bottom. Next, press the eyes area a little bit with your finger, pull up the narrow end for the nose and flatten the side where the mouth is. 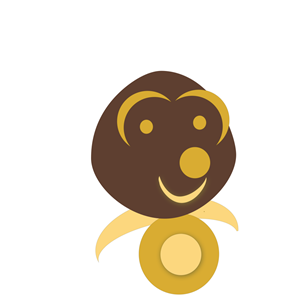 Step 4: Let's make the facial components now. For the nose, roll small ball shape dough and paste it on to the face area where was pulled out a little bit in previous step. 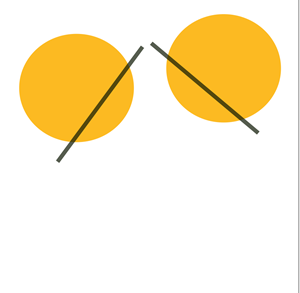 For the eyes, make two small holes with clay stick or chopstick if you don't have the tool. 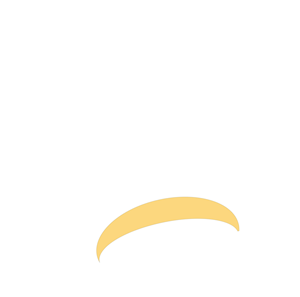 Roll two small spaghetti shapes and bend it around the eye's holes for eyebrows. As for the mouth, you have 2 option. 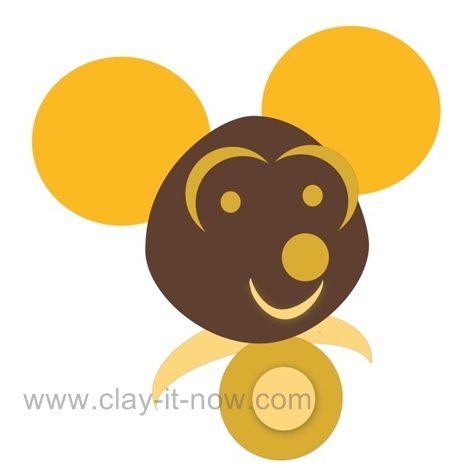 The easy way is to use your smile clay tool to draw a crescent/ half circle. If you don't have the tool, use split drinking straw. For variation, you may follow my figurine picture to create bigger smile. Step 5: Roll 2 ball shapes dough to about 1 centimeter and flatten it with your index finger. Cut the bottom part as shown in the picture. Step 6: Paste the ears to both side of head and attach the head to the body. Insert the hook/ jewelry pin and it's ready for baking. 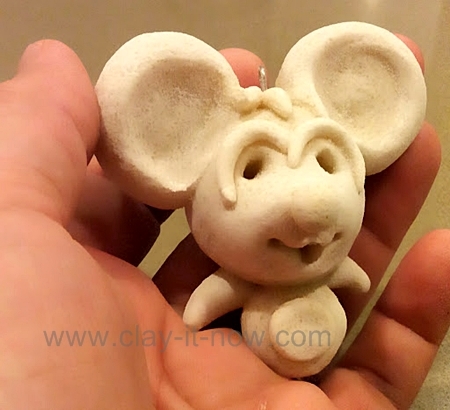 You can then paint the rat salt dough after baking with oil paints.